We have been living in challenging times; some would say the worst is yet to come, yet there are others who believe the future is very rosy indeed. This week Dr Gary Alexander and I got together to share a little about what the future means to us. 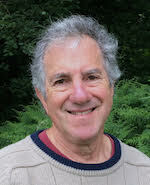 Gary Alexander, former trustee of the Transition Network, and one of the first Open University lecturers, initially published his book eGaia in 2002, partly to ensure the ideas of his deceased friend and mentor Prof. Michael Hussey were brought to the world, but also because he believed the time was right to put forward a global view that was essentially Utopian. 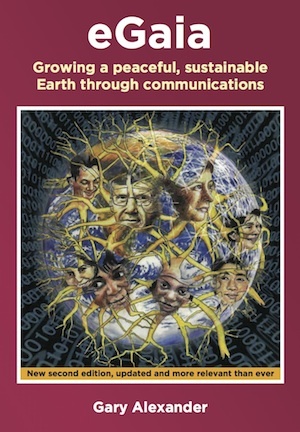 A revised edition of “eGaia” came out last year, containing updates that included Dr Alexander’s insights from having been a part of the Transition Movement as well as having observed the spread of many other positive initiatives that fuelled his hopes that the future is not only bright but well within our grasp. Both writers with a distinctly Utopian flavour, it was inevitable, with our shared background of having worked closely with the Transition Network in its early days that we would, at some point, choose to come together and share some of our thinking. I got started first; although “eGaia” is essentially a work of non-fiction, a distinct chapter is set in the fictional future of the Pinecone Partnership. I wanted to know what the inspiration for writing the future element of eGaia was. I’ve also found writing them a lot of fun. It is easy to bring in bits of humour, for example, to lighten a serious discussion. My own book; “Tales of Two Times”, set in the year 2050, is still very much work in progress, but, like Gary, it recognises the beauty and the clarity of the short story, having begun life in 2009 as a commissioned tale to celebrate the Launch of the Energy Descent Action Plan in Totnes by our now Mayor and Green Party candidate Cllr Jacqi Hodgson. At that time, I had no notion of the part storytelling was to play in my life from then on. However, it wasn’t long at all before I was fully engrossed in planning a story walk around England. I always feel rather cautious about sharing this; our society tends to be a little wary of unorthodox ways of going about things, but to tell the truth it was literally a dream that inspired it. I woke up in the middle of the night with a very clear set of instructions; to walk all around the country visiting different Transition Initiatives, towns, cities and villages, collecting and sharing their stories. Why? The instructions were very clear; so that they could be written up into a book so that the positive tales could be disseminated widely,both nationally and internationally. That book, “Tales of Our Times”, was published in 2013. It wasn’t long afterwards that I became aware that the walk project was not yet finished. I had been hosted by rich and poor, religious and atheist, men and women, young and old, of differing socio-political persuasions and have come to believe that the future all those diverse people who had offered me hospitality could see was so similar that it had to be a very real possibility. It was time to write the book that would spread the positivity a lot further. I had also become aware of the timeless cross-cultural nature of stories and the importance of the past when talking about the future in the present. I asked Gary about his decision to refer both to the past and the present just as much, if not more, than the future in his book. Bringing in the past is partly to show that our evolutionary heritage is as the ultimate cooperative ape, and is much more of our birthright, than, for example, being a shrewd trader. And there are many more examples of cooperation in the present, and growing all the time, to inspire people (including me). It seems both Gary and I are working towards the same end. He wanted to know if my new book is just a book to read, or if I have some purpose in mind, some effect I wish to create? As I said earlier, my purpose is to spread positivity. Having said that, however, my intention with “Tales of Two Times” is many faceted; I do not see its role as evangelising, but as simply to inspire. Gary: “Who do you imagine might want to read “Tales of Two Times”? If this new Utopian tale serves simply as a good read, then that in itself is worthwhile as a culture fond of good news is a happier one to reside in that one addicted to bad news, as we currently seem to be. I am also aware that there are those on the verge of stepping into something different; a growing dissatisfaction with the distractions that have served as our fulfilment for so long is leading them to question their purpose, and that for these a tale of Utopia might add fuel to their fire, or fan the flames of those already seeking a new way to live. I’d like to think that it will be enjoyed on many levels by many people. I imagine you might be curious about where writers’ ideas for the future come from. I asked Gary where his ideas came from. “Many sources. I’ve tried to pull together in one place the best ideas I’ve encountered about sustainable living, about handling conflicts, about organising groups that work well without hierarchy. A fair part is from my own experiences, but a lot is from what I’ve heard or read about, and only a little is just from my imagination. This certainly matches my experience of having listened to hundreds of people’s stories about how they are choosing to live, about the society they are working hard to create. In my case too, part of my Utopia has its genesis in imagination. I hesitate to leave that statement at that for imagination has come to be a word that is not readily understood. Its root is “Imaginari”; to picture oneself, as every good business planner must do. The capacity to allow oneself to break free of received wisdom and the shackles of the dominant story in order to see with fresh eyes is innate in all humans. It is our saving grace; the faculty that gets us out of trouble over and over. That said, I am aware that in both future scenarios; “Tales of Two Times” and “eGaia” there isn’t a lot of characterisation. “Is this a deliberate device?” I asked Gary. “Well, only a little. I don’t think creating imaginative fictional characters is one of my strong points, and I apologise for that at the beginning of the fictional chapter. Well, it’s work in progress for me. I have to make the decision as to whether bringing my characters to life will add to my story’s magic and power to inspire or whether the essential truth of the tale will be stronger without. This is a hard question for me to answer. Certainly my storytelling journey brought it about that I shared my tales in folkloric style, which really formed the basis for the “Tales of Our Times”, so in a sense the tales in that book began life as oral storytelling so it is not unreasonable to suppose that it might lend itself very well to being read aloud. It is interesting, given the genesis of the tales, that I had not given this any thought before now. Of course, somehow it has to be, and quite how it is to read a book that is written in the oral style is maybe akin to reading poetry. One has to be quite a fan to drop into the timeless zone required to appreciate it in all its nuances and there is nothing quite like its creator reading it aloud. What is important about this question for me is that whenever there has been a culture shift stories are told of it, stories that we now in our times read of in books, some so old that the edge between fact and myth is blurry. Some of these ancient stories will be woven into the fabric of “Tales of Two Times”. We don’t have any factual details of the life of King Arthur, yet his stories are deeply embedded into our culture; a time of great change and upheaval; when the older belief systems and status quo were being eroded by the newer Christianity and traditional land and community boundaries and people’s allegiances were being challenged. It is difficult for us to know where fact and metaphor overlap, given the passage of time, and no doubt the actions and events were originally told at fireside by bards as stories, to make them memorable, and taken from place to place to spread the news, not dissimilar, in fact, to the way in which my story collecting project unfolded. I think my answer to this question is that “Tales of Our Times” most certainly is of this ilk, for it tells of the deeds of our times in real time. “Tales of Two Times” may well belong to a different genre; with its unique blend of true stories of today’s world, teaching stories from our ancestors, and the fictional Utopia of 2050, but in essence, yes, perhaps it too belongs to the tradition of oral storytelling, especially given that part of the research for it will be done on another story telling walk. that I think that as more people come to understand how it could be, they will join those now building that future. In the second edition of “eGaia”, I tried especially to show a route through to the vision that is doable, that starts small and builds, without confronting the power structures. It may take an economic crash to free people from the dominant beliefs before it can happen on a large scale. But such a crash might also result in such chaos that it creates total repression that stops this vision from happening. There are certainly no guarantees that it will come to pass. I find Gary’s honesty and balanced view refreshing. In my case if I am not focused on the future and living my life the best as I can in the way I see the future being, then I tend to fall prey to the negativity that I see peddled night and day on social media, having long since stopped the daily perusal of papers and television news, and this has the effect on me of numbing my feelings. I suspect I am not alone in this as the more sensitive of us can become overwhelmed by an overload of so many things that are not right that we do not have the personal power to be able to put right. I take the stance that actions follow where we put our attention and that focusing on what we can do, changes we can make that are for the benefit of all, we slowly shift the balance towards that which we do want, without alienating those whose actions we do not understand. It feels important to me to finish off this conversation about the future with a sense of how far along we are towards our vision. “Yes, and more and more all the time, on various scales. There are the big background trends, like the degree of connection through technology and social media which has grown massively since the first edition. “Is there a larger picture, larger goals for you, that you see “Tales of Two Times as part of”? When I read “A taste of an eGaian future”, the fictional chapter in “eGaia”, and I rest my thoughts on my own Utopian vision, I have no doubt at all that we humans are fundamentally linked, interconnected, to one another and also to the great network of life that Gary and others call Gaia. These are not our dreams, visions of the future; they are the future speaking through us and many others alive at this time. We each of us have a part to play and that is what I find endlessly exciting and fulfilling. If I have a larger personal goal it is to live even more closely to how I have “pictured the future” for quite apart from the sense of personal fulfilment that will bring me, there is surely no better way to inspire others than to simply be that which you believe in. It adds too, a handy detailed appendix referencing all the protagonists, so that our descendants will know the truth behind the tales. 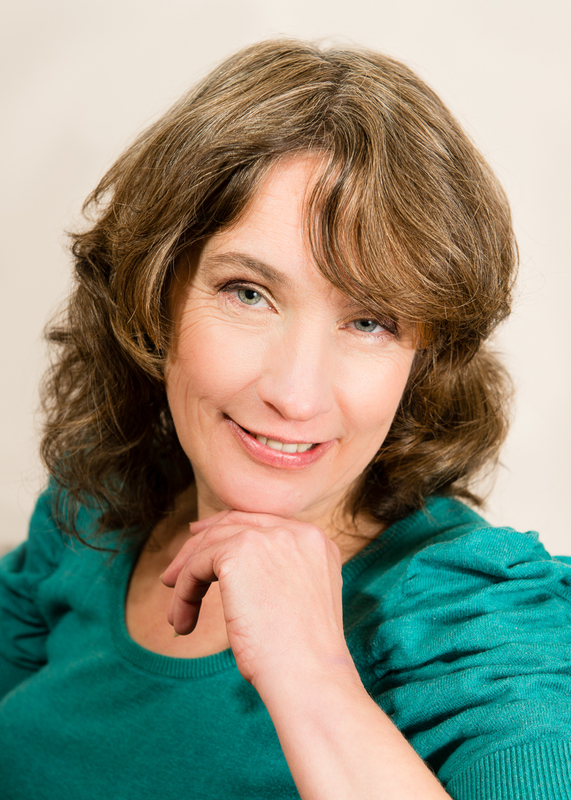 in June of this year, when I will be collecting stories of those involved in what in Transition jargon is known as Inner Transition.